GLOBAL AWARENESS 101 - Let your VOICE be heard and get involved. OUR future depends on it! : JERUSALEM: Radical Islamic Jihad And Pan-Arabism In Its Violent Form Find A Common Root In Amin Al Husseini, The Grand Mufti Of Jerusalem And Hitler/Nazis. He Is The Vector Of European Fascism Into The Modern Islamic World. JERUSALEM: Radical Islamic Jihad And Pan-Arabism In Its Violent Form Find A Common Root In Amin Al Husseini, The Grand Mufti Of Jerusalem And Hitler/Nazis. He Is The Vector Of European Fascism Into The Modern Islamic World. Radical Islamic Jihad and pan-Arabism in its violent form find a common root in Amin Al Husseini, the Grand Mufti of Jerusalem. He is the vector of European fascism into the modern Islamic world, both religious and secular. One cannot understand today's turbulent world without this information. Before Amin Al Husseini, Jews and Muslims lived side-by-side with members of other religions throughout the entire middle east and North Africa for centuries. 1893 Amin Al-Husseini. Born in Jerusalem under Ottoman rule. 1914-1917 Husseini’s First Taste of Jihad, Allegiance to Ottoman Empire, Amin Al Husseini: Ottoman Empire Officer: Amin Al-Husseini swears allegiance to the Ottoman Empire during the Armenian genocide. He is an officer stationed in Smyrna and participates first-hand in the Armenian genocide. One and a half million Christians are slaughtered under the sword of Islamic Jihad by the Ottoman Army. Allegiance to Ottoman Empire and Islamic world take-over will be echoed by Osama Bin Laden in his post-September 11th declaration. 1917 Pan-Islamic Vision Comes to Palestine: Amin Al-Husseini returns to Palestine. He brings with him lessons of genocide and the vision of leading a Pan-Islamic empire, where Jews and Christians are not acceptable. 1920 The Violence Begins: 1920/1921. Riots. Amin Al-Husseini becomes lead figure in organizing riots against locals. Amin Al-Husseini begins life-long campaign of inciting hate between Jews and Muslims under British Mandate of Palestine. He begins rule of terror over local Muslim leaders, who denounce him as an ignorant thug. 1921 Grand Mufti Against The Will of The People: The British, against the local Muslim vote, appoint Amin Al-Husseini as Grand Mufti of Jerusalem. Amin Al-Husseini came in a poor fourth place in the vote. The Muslim community rejected his candidacy because he had not received any credible Islamic education. He was neither a Sheikh (religiously accredited leader) nor an Alim (Islamic scholar). He becomes the pre-eminent Arab power in Palestine. His brutality becomes notorious and is rejected by local Muslim leadership. 1922 Head of Supreme Muslim Council: Amin Al-Husseini is appointed Head of Supreme Muslim Council (1922-1937). He is hugely disappointed by the end of the Ottoman Empire under Ataturk. Husseini becomes fanaticized by the idea that he must restore the lost Islamic Empire. He vows to fight all Muslim seculars. 1922 Jerusalem Capital: Amin Al-Husseini implements restoration of Dome of the Rock and Al Aqsa Mosque in Jerusalem. He has the Dome gold-plated for the first time. Thereafter, Jerusalem takes on more importance as Holy Muslim site in the eyes of the Arab World. 1928 Husseini Joins Muslim Brotherhood: Muslim Brotherhood established in Egypt by Hassan El Banna in 1928. Amin Al-Husseini becomes a central member and ideological inspiration for the Muslim Brotherhood. Mother organization for today’s Egyptian Islamic Jihad and Hamas. The Muslim Brotherhood preaches Wahhabi Islam, which justifies violent means to rid the ‘Muslim world’ of its non-Islamic element. It envisions a Pan-Islamic Empire, where strict Islamic law rules over all. 1929 Hebron Massacre: Amin Al-Husseini organizes more riots in Palestine. He spreads false rumors to further turn the local Muslims against the Jews. Random murdering of Hebron Jews begins. Hebron Jewish community was over 2,000 years old. 1931 Founder of World Islamic Congress: Amin Al-Husseini starts to build his own political base. He preaches Islamic unity and creates the World Islamic Congress in 1931. Young Egypt. Led by Muslim Brotherhood member Abdul Gamal Nasser (future Egyptian President). Young Egypt’s political slogan “One Folk, One Party, One Leader” is a direct translation from German of Nazi slogan. Social Nationalist Party in Syria. Led by Anton Saada (known as the Syrian Fuhrer). 1936 Husseini Meets Hitler’s banker: Francois Genoud, later known as the Swiss Banker of the Hitler’s Third Reich, travels to Palestine to meet Amin Al-Husseini for the first time. Their relationship will continue well into the 1960’s. Amin Al-Husseini is main organizer of riots. He organizes suicide squads against the local authorities. Applies Nazi methodology of “systematic extermination” of any Arab suspected of less than total loyalty to Pan-Islamic vision of Muslim Brotherhood. Any “non-Islamic” element is a threat to his Pan-Islamic vision. Many Muslim and Christian Palestinian intellectual leaders and clerics assassinated for protesting Husseini’s Islamic terror. 1936-1938. Murdered by Husseini’s men: Sheikh Daoud Ansari (Imam of Al Aqsa Mosque), Sheikh Ali Nur el Khattib (Al Aqsa Mosque), Sheikh Nusbi Abdal Rahim (Council of Muslim Religious Court), Sheikh Abdul el Badoui (Acre, Palestine), Sheikh El Namouri (Hebron), Nasr El Din Nassr (Mayor of Hebron). Between Feb. 1937 and Nov 1938, Eleven (11) Mukhtars (community leaders) and their entire families slain by Amin al Husseini’s men. 1937 On Hitler’s Payroll: Amin Al-Husseini visits Jerusalem German Consul. He meets SS Hauptschanfuehrer A.Eichman and SS Oberscherfuehrer H. Hagen to discuss “the Jewish question”. Amin Al-Husseini subsequently receives financial and military aid from Nazi Germany. Amin Al-Husseini arrives in Rome, where he meets fascist leader Benito Mussolini, the genocidal butcher of Ethiopians in Africa. Mussolini vows to help the Palestinian cause against the Jews. From Rome, Husseini declares Fatwa-Jihad against Britain. He preaches the notion of Pan-Islamism, with vision of Muslim unity to further his cause. 1941 Husseini-Tulfah Iraqi Pro-nazi coup, Palestinian Volunteers to the Iraqi Army for 1941 Pro-Nazi Coup in Bagdad: Amin Al-Husseini instigates a pro-nazi coup in Baghdad, Iraq. Kharaillah Tulfah is his right-hand man. Tulfah is Saddam Hussein’s mentor and uncle. Germany sends weapons and aircrafts to Husseini. Coup fails. Amin Al Husseini in Bagdad with Rashid Al-Qailani, Leader of Pro-Nazi Iraqi Coup 1941. 1941 European Jews Must Not Make It To Palestine, Amin Al Husseini In Berlin during WWII: Amin Al-Husseini in Berlin meets with Adolf Hitler and is active in the decision to exterminate all Jews through the infamous Final Solution. Amin Al Husseini Meets Hitler in Berlin During WWII. Hitler was reportedly content with deporting the Jews out of Europe to Palestine. Husseini perceived this as a threat to his stronghold in Palestine and pushed successfully for the extermination of the European Jews. April 25th. Amin Al-Husseini is made chief architect of Nazi offensive in Bosnia. Serbian-Cyrillic alphabet outlawed. Orthodox Serbs forced to wear Blue armband. Jewish Serbs forced to wear Yellow armband. While in Bosnia, Amin Al-Husseini takes the title “Protector of Islam”. One hundred thousand (100,000) Bosnian Muslims join the Nazi ranks. They seek Nazi approval to establish autonomous Nazi protectorate for Bosnian Muslims. Amin Al-Husseini approves the Pejani Plan, calling for the extermination of the Serbian population. Nazi Germany refuses to implement the Pejani plan. Husseini’s legacy of hatred is a major factor in today’s Bosnia/Herzegovina conflict against the Serbs and their leader Milosevic. 1942 10,000 Children Die: Amin Al-Husseini intervenes personally with Nazi High Command to block Red Cross offer of exchanging 10,000 Jewish children for Nazi prisoners of war. They will die in Hitler’s gas chambers. Amin Al Husseini creates the Hanzar Division of Nazi Muslim Soldiers in Bosnia, which he calls ‘the cream of Islam’. It becomes the largest division of the Third Reich Army (26,000 men) and participates actively in the genocide of Serbian and Jewish populations. ‘Hanzar’ was the name given to the dagger worn by officers under the Turkish Ottoman Empire. Muslim soldiers pledge allegiance to Nazi regime in official statement prepared by Heinrich Himmler, head of SS Nazi troops. Amin Al-Husseini is made Prime Minister of Pan-Arab Government by Nazi regime. His headquarters are in Berlin. He plans construction of concentration camp in Nablus (Palestine) to implement the “final solution” in Palestine to exterminate the Jews there, as an extension of Hitler’s plan. Mufti becomes close friend of Heinrich Himmler, Head of SS (Nazi Officers). Amin Al-Husseini is given a private tour of Aushwitz death camp by Himmler, where he insists on seeing first-hand the murder of Europe’s Jews. Islamic Institute in Dresden, Germany Nazi Islam: Heinrich Himmler, Head of SS, and close colleague of Amin Al-Husseini, financed and established Islamic Institute (‘Islamische Zentralinstitut’) in Dresden under the Mufti. The purpose was to create a generation of Islamic leaders that would continue to use Islam as a carrier for Nazi ideology into the 21st century. 1944 Co-founder and President of Arab League: Amin Al-Husseini is one of the founders of Arab League. Goal is to reinforce Pan-Islamic unity. Founding countries are: Egypt, Iraq, Jordan, Lebanon, Saudi Arabia, Syria and Yemen. Husseini is appointed to President in Absentia of Fourth Higher Committee of Arab League. 1946 British Forgive Husseini: Shockingly, the British give Amin Al-Husseini amnesty. He returns to Palestine. 1946 Leader of Muslim Brotherhood: Amin Al-Husseini is appointed leader of Muslim Brotherhood in Jerusalem. Saudi Wahhabi Islam becomes the perfect vector for Husseini’s policy of ethnic cleansing. 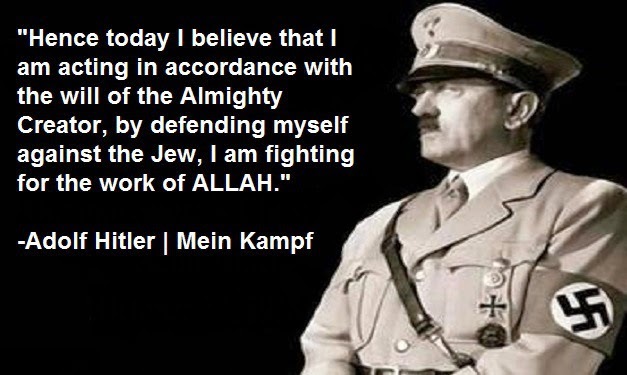 He uses recently acquired Nazi methodology to implement his vision of an Arab World free of Jews (Juden-Rei in German). 1946 Amin Al-Husseini Wanted for Crimes Against Humanity: Yugoslavia requests extradition from Egypt of Amin Al-Husseini for War Crimes, and Crimes against Humanity. Egyptian government refuses to release him. 1946 Yasser Arafat’s Teacher and Uncle Amin Al-Husseini: Egyptian-born Yasser Arafat meets Amin Al-Husseini at age 17 and starts to work for him. Amin Al-Husseini allegedly great-uncle of Arafat, whose real name is Mohammed Abder Rauf Arafat Al-Kudwa Al-Husseini. Arafat reportedly changed his name intentionally to disguise his connection to Amin al-Husseini. 1948-1949 Husseini “I declare a Holy War!”: With UN recognition, Israel declares statehood. Arab League immediately declares Jihad (Holy War) against Israel. Egypt, Iraq, Syria, Saudi Arabia and Jordan immediately declare war on the new Jewish state and invade Israel. Arab League Four Wars: The Arab League, co-founded by Amin Al-Husseini, will support and declare all wars against the State of Israel in the 20th century. (1948, 1956, 1967, 1973) It will also support both Intifadas. 1949-1952 ODESSA Network Losers Regroup: ODESSA network. Egypt, home of Muslim Brotherhood, and Syria incorporate thousands of Nazi experts into Egyptian and Syrian army, government and propaganda service. Vatican heavily involved in providing travel visas for Nazi officers. Amin Al-Husseini is directly implicated in providing safe haven to ex-Nazis in Arab lands. He is the main connection with Francois Genoud, Swiss banker of Third Reich, who finances the ODESSA network with money stolen from European Jews. Husseini-Genoud Connection Nazi Money To Fund Twenties Century Jihad: After World War II, Hitler’s Swiss banker, Francois Genoud, visited Amin Al-Husseini multiple times in Beirut. Genoud finances the ODESSA network. He sponsors Arab Nationalism with Nazi money. In Cairo and Tangiers, Genoud sets up import-export company called Arabo-Afrika, which is a cover to disseminate anti-Jewish and anti-Israeli propaganda. Genoud sets up Swiss bank accounts for North African liberation armies of Morocco, Tunisia and Algeria. In partnership with Syria, he sets up Arab Commercial Bank in Geneva. In 1962, he becomes Director of Arab People’s Bank in Algeria. 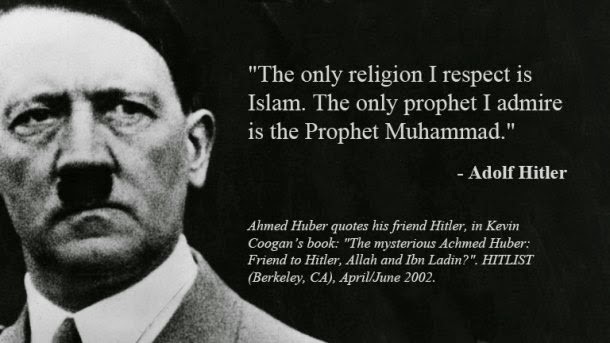 Ahmed Huber, Hitler Admirer Muslim Brotherhood Egypt Safe Haven for Nazis Contact with Amin Al Husseini, Francois Genoud, Johannes Van Leers: Albert Freidrich Ahmed Huber (aka Ahmed Huber), born in 1927, is a Swiss journalist, who became a major financier of radical Islam and pan-arabism. 1962 President of World Islamic Congress Arab Lands Judenrei (Free of Jews): Amin Al-Husseini becomes president of World Islamic Congress, which he founded. The Islamic Fundamentalists implement plan of making Arab lands Judenrei (free of Jews), as Hitler did in Europe. All Jewish communities of North Africa and Middle East are persecuted. Hundreds of thousands of Arab Jews, whose presence in Arab countries predates Islam by a thousand years, are killed or forced to leave their homelands. In 1969, the (OIC) Organization of Islamic Conferences is founded and sets its headquarters in Jeddah, Saudi Arabia. It is an offshoot of the World Islamic Congress founded by Amin Al Husseini in 1926. The First Secretary General (1971-1973) is H.R.H. Tunku Abdul Rahman, Prime Minister of Malaysia. The OIC is made of 56 Islamic countries. 1974 Amin Al-Husseini dies in Syria, leaving a legacy of terror, which continues to this day.